i have my second class, international social work, in a few minutes and wanted to pen a quick "thinking of you" post. i can't thank you enough for the kind emails, tweets, facebook posts, and blog comments on my gramma. you've truly warmed my heart. yesterday i booked a whirlwind flight to texas first thing tomorrow, back sunday morning at 1am, and fly to mexico sunday morning at 8am for an art retreat. lordie! oh, and to make it more fun, i'm sick. hmmm, now tell me mind and body aren't connected! heavy heart has translated to sick body. however, i'm not writing to whine. seriously, who needs that? the sun was shining today, the sky was blue, and i get to snuggle gramma tomorrow. life is good. i'm writing to ask you your 2012 dreams. how are they unfolding so far? 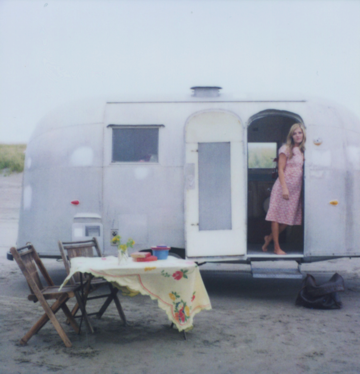 i'm longing for a bit of stability to begin my search for the vintage airstream i've been itching for the past year. since le beau's cabin is so, well, boy, i need a hideaway while i'm there. a little girly country escape. and lord knows i could use a special space to showcase my milk glass and vintage linens!